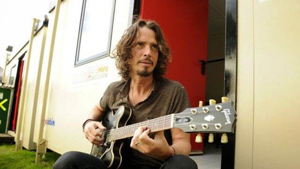 In celebration for the release of his new album Higher Truth, SOUNDGARDEN vocalist Chris Cornell has announced a North American solo acoustic tour for fall 2015. The multi-city trek will give fans the chance to see Chris perform in an unplugged, up close and personal setting and will include songs spanning his entire career. Chris will also introduce songs from his new studio album, Higher Truth, produced by Brendan O’Brien and scheduled for release on September 18th. Fans have access to a special pre-sale which runs from 10 AM, EST on June 2nd to 10 PM, EST on June 4th. More info at ticket links at ChrisCornell.com. Password: KEEPER (not case sensitive). Note: Modesto's pre-sale will take place by phone - call 209-338-2100 from 12 noon PST. In addition, an exclusive pre-sale for American Express cardholder members will run from June 3rd at 10 AM. Venue pre-sale dates will vary and tickets will go on public sale at various times on June 5th and June 6th - check ticket sites for details. $1 from every ticket sold will go to the Chris and Vicky Cornell Foundation, a charitable organization that helps to protect the most vulnerable children facing problems such as homelessness, poverty, abuse or neglect. As previously reported, Cornell will tour Australia and New Zealand in November/December 2015 in an unplugged, up close and personal setting.